Denmark is a Scandinavian country made up of nearly 500 islands, located north of Germany. It has a total landmass of only about 16,600 square miles, making it the smallest of the Scandinavian countries. Most of Denmark is located on the peninsula of Jutland, which borders Germany. The major islands of Zealand, Funen, and Bornholm are home to the majority of Denmark's 5.5 million residents. Denmark is linked geographically with northern Europe, and has more than 4,500 miles of jagged, irregular coastline. With a maximum elevation of only 565 feet above sea level, Denmark is a low-lying country. However, just because it's low-lying, doesn't mean the country is flat. On the contrary, Denmark comprises small, steep hills, and low, long rises, as well as forests, rivers, lakes, and beaches. 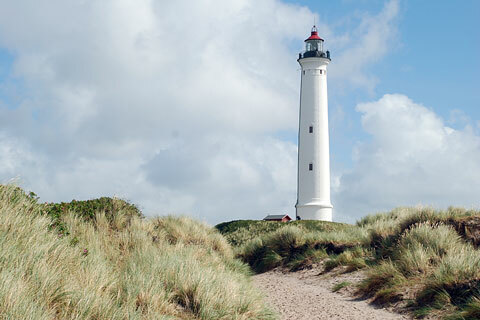 The west coast of Jutland, which is located on the North Sea, is not a good host to ships because of its many sand dunes and small sand banks. These dunes and banks are left over from Denmark's earliest glacial terrain. As a matter of fact, much of Denmark's current landscape was formed during the last Ice Age, and is a result of the movement of icebergs during that time. Jutland's east coast is home to fjords such as Lim and Mariager. Denmark's longest river is the Gudena, which meanders on for 80 miles. The Gudena rises in north central Jutland and makes its way to the eastern side of the peninsula, where it feeds into Lake Lanso. Denmark opens toward the Baltic Sea in the east. The Baltic Sea surrounds Bornholm, one of Denmark's major islands. As a result, this island has different flora than the rest of the country. Map of Denmark, showing major cities, roads, and ferry routes. Denmark has set aside about 3.5% of its landmass as a nature reserve, making a name for itself as a leader among environmentally conscious countries. The protected land includes Rebild National Park in northern Jutland, the chalk cliffs of Mon, and the tidal sands off the West Coast of Jutland. These tidal sands represent some of the world's most treasured wetlands. The Kingdom of Denmark also includes Greenland and the Faroe Islands, although these islands enjoy a great deal of autonomy and self-government. Get to know Denmark a little better by spending some time studying the map of Denmark shown below. Click on the map to display a higher resolution Denmark map, showing Denmark's traditional amter (counties), population centers, roads, and ferries. Note that, effective January 1, 2007, the 15 amter were replaced by 5 regions. Colorful map of Denmark, showing the 13 traditional Danish Counties. Map of Finland - Finland map and visitor info. Map of Norway - Norway map and travel information. Map of Sweden - Sweden map and travel information. Visit Denmark - official travel and tourism guide to Denmark. Danske Links - categorized links to Danish websites.